Some nights require a super easy dinner, am I right? 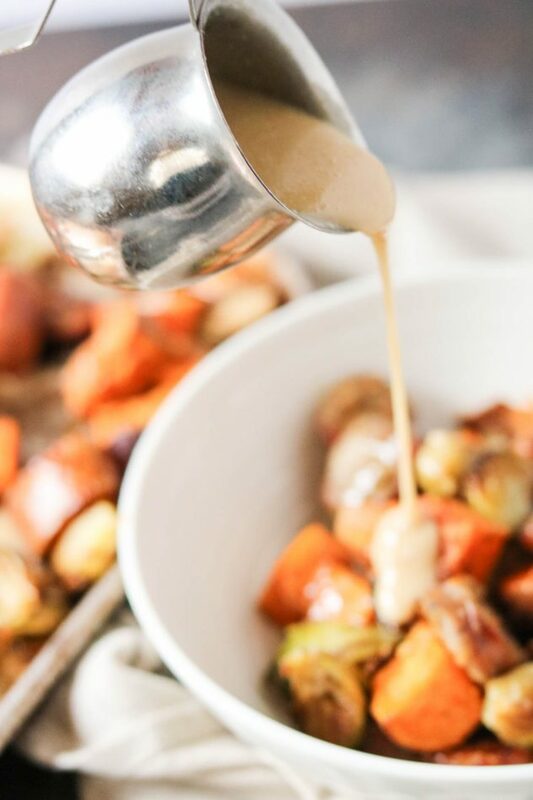 These pan roasted vegetables include chicken apple sausage and a maple tahini sauce that make it not only quick and easy but also super tasty. You could probably choose any root vegetables you liked for this, but I went with brussel sprouts and sweet potatoes. I’m always looking for new ways to cook brussel sprouts and this one did not disappoint. 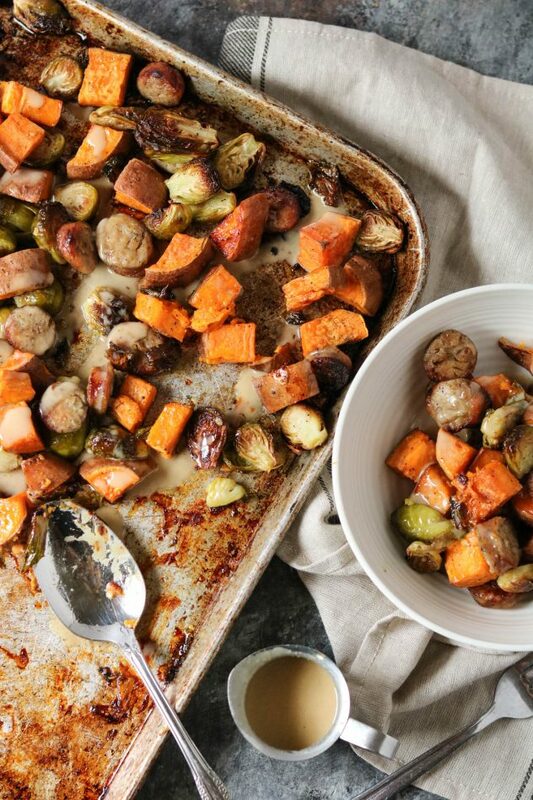 The maple tahini sauce pairs well with the chicken apple sausage and sweet potatoes, too. I’ll admit, this was actually my first time incorporating tahini into a recipe. I had seen it before but had never actually tried it. Tahini is basically like peanut butter but is derived from sesame seeds. You can usually find it with the other nut and seed jars of butter at the grocery store. The key with this sauce was getting the liquid base right. I first tried olive oil but it overpowered the maple and tahini flavoring, so then I decided to thin it with water only and a hint of lemon juice. Now, for some real talk. If you have teenage kids like mine, getting them to switch over and try new recipes like this is a challenge. Unfortunately, I didn’t wise up to changing my eating habits until later in life, and by that time my kids were hooked on processed and fast foods. I know, terrible, right? I’ve slowly been introducing them to new healthy recipes, but it’s like converting the masses (did I mention I have 4 grown kids!) I figure they’ll eventually come around, but for now, I’ll keep cooking new recipes and letting them try if they’d like. With that being said, this is a great quick and easy healthy dinner and if your kids love vegetables then it’s a double win-win. 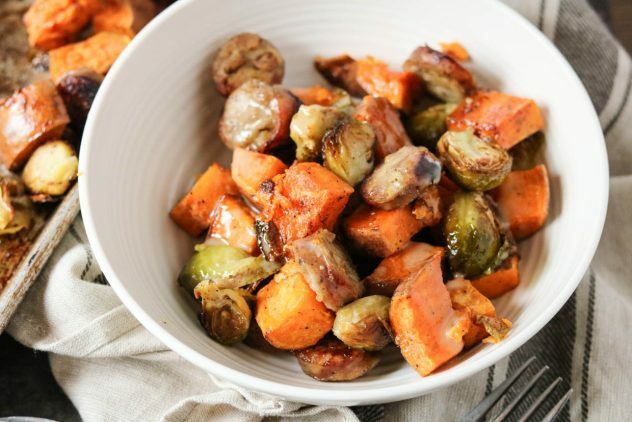 Roasted brussel sprouts and sweet potatoes with chicken apple sausage and a maple tahini sauce makes a perfect quick and easy dinner your whole family will enjoy! Cut sweet potatoes into small chunks and add to a large mixing bowl. I leave the skin on for this recipe. Cut the bottoms off of each brussel sprout and then slice in half, add to mixing bowl. Add garlic, sea salt, pepper, olive oil, and mustard powder. Mix until the vegetables are well covered with the oil mixture then spread out evenly onto a baking sheet. Cut the chicken apple sausage into slices and add to pan. Place pan in the oven and cook for 40 minutes. While the vegetables are cooking, combine all maple tahini ingredients in a small bowl and whisk to combine. Once vegetables are done, remove from oven. 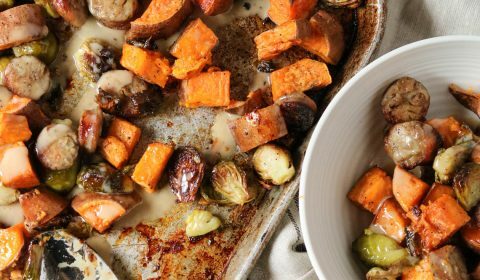 Drizzle the maple tahini over the pan and serve immediately.